Brian France was born on the 2nd August, 1962 in Daytona Beach, Florida USA of Caucasian ancestry. France is a businessman, the CEO and the chairman of the largest motorsports organization in the USA – NASCAR. He took over the position from his father Bill France, Jr. in 2003. Prior to that, he had been involved in the establishment and management of the Craftsman Truck Series. France has been named one of the 100 Most Influential of the Century by Time magazine in 2006. Moreover, he is considered to be the most influential and powerful sports executive by Forbes, Sports Business Journal, Sporting News, Businessweek and other magazines. How rich is the businessman? Authoritative sources estimate that the overall size of Brian France’s net worth stands at $1 billion, as of the data presented in the middle of 2016. To begin with, Brian had an opportunity to learn the business of NASCAR from adolescence as it was his family business, in fact the first work he did in the business was starting at the bottom, working as a janitor at the motorsports complex – Talladega Speedway. Talking about his education, Brian France matriculated at the University of Central Florida, although he dropped out of it after the first few years with a view to enter the NASCAR business, which later added huge sums to the total size of his net worth. Concerning his career in the family business, France began with managing a few short tracks such as Tucson Raceway Park. Then, Brian continued launching the NASCAR Entertainment Division, which created associations in the entertainment industry as well as NASCAR. This resulted in product placement in the press, various events, Hollywood films as well as on television. France also created the pick-up truck racing series called The NASCAR Camping World Truck Series, which was launched in 1995. Due to it and his huge success, he was promoted to the position of the marketing director. In 2003, he took over the control of the whole business, becoming the CEO and Chairman of NASCAR. France is known for introducing some new rules as well as signing a multi-billion dollar contract with NBC. Currently, NASCAR races are broadcast in more than 150 countries world-wide. It should also be noted that Brian France has been involved in a number of controversies related to NASCA, being panned by NASCAR fans because of his radical changes in the organization of the company. One of the most controversial changes was the end of the raceway named Mountain Dew Southern 500 in North Carolina and the extinction of another raceway – Darlington Raceway. Another controversial fact was the introduction of Toyota, the rival group of American Ford Motor Company into NASCAR. 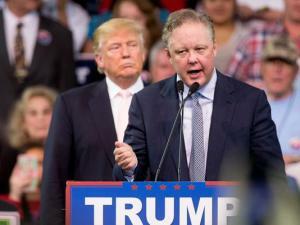 Brian France has become a symbol of NASCAR criticism era. Additionally, France is also the managing director of the marketing company Brand Sense, whose clients include Tony Stewart, the Goodyear Tire & Rubber Company, and Britney Spears. Finally, in the personal life of the businessman, he has been married to Amy France since 2008, and they have two children. He was previously married to Megan Garcia twice, from 2001-04, and then 2005-08. Parents Betty Jane France, Bill France, Jr.
1 President of NASCAR, 2003 - present. 2 Son of Bill France Jr..